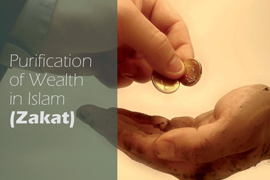 Zakat is one of the five pillars of Islam, and is expected to be paid by all practicing Muslims who have the financial means. It is considered to be a personal responsibility for Muslims to ease economic hardship for others and eliminate inequality. In the Qur'anic view, zakat is a way to redistribute the wealth, thus increasing the flow of cash in the economy with a particular interest in the poor and the dispossessed Muslims. 1. Passage of One Year: Zakat is obligatory after a time span of one year passes with the money in the control of it's owner. Then the owner needs to pay 2.5% of the money as Zakat. 2. Deduction of Debts: The owner should deduct any amount of money he or she borrowed from others; then check if the rest reaches the necessary nisab, then pays Zakat for it.